Adaptive models are scoring models built on the Pega 7 Platform that can capture and analyze customer responses in real time. Adaptive models identify the most suitable proposition for a customer or determine the proposition that the customer is most likely to accept. Delayed learning is a way of updating these models by providing input about customer decisions to the Adaptive Decision Manager (ADM) server. ADM collects data about customer behavior that can be used to predict the next best action for customers. You can use delayed learning of adaptive models in outbound campaigns where the response from a customer is not immediate. Delayed learning is a two-step process for which you need instances of the Data Flow rule and the Strategy rule. First, you need to collect and store data for later response capture. Next, you need to capture responses for previous decisions. The process is governed by instances of the Data Flow rule. Instances of the Strategy rule are required to set the correct values for adaptive models and the outcomes. As a Decision Architect, you configure the delayed learning options in the Strategy shape of a data flow. In this example, the DecisionFlow data flow references the MakeDecision strategy. The strategy uses adaptive models to collect data for a particular offer on a specific channel and direction. 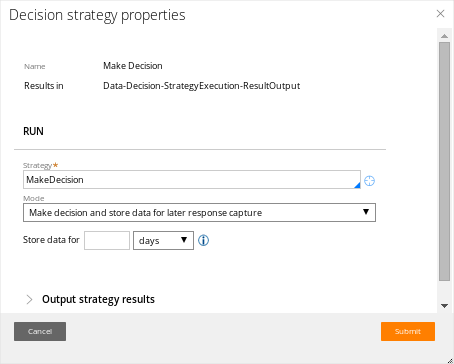 To store data for later response capture, the strategy must operate in the Make decision and store data for later response capture mode. During the execution of this Strategy shape, all the field names that are marked as predictors in the ADM models are collected and stored in the pxDecisionResults data set by means of the pxDelayedLearningFlow data flow. Along with predictor information, this data set stores Interaction ID and Subject ID to uniquely identify all the records. 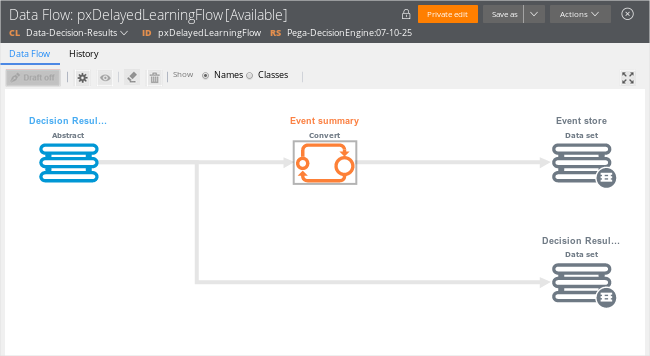 Apart from this, the pxDelayedLearningFlow data flow captures a snapshot of the Make Decision strategy results and stores them in the Event Store data set. Storing results in the Event Store data set is necessary to capture responses for previous decisions without providing an Interaction ID. 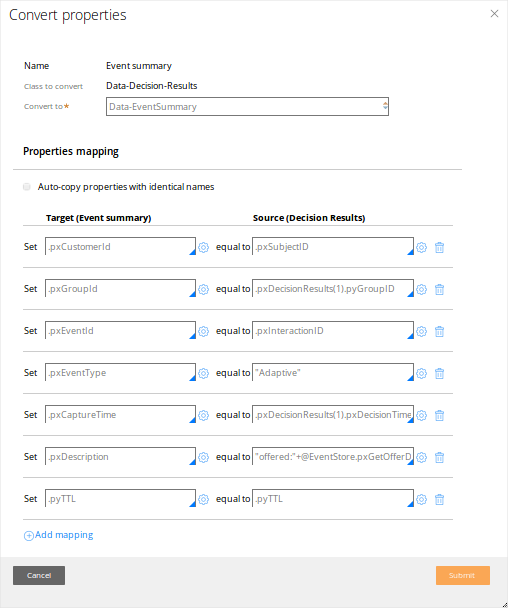 To save the snapshot of the Make Decision strategy results, the Convertshape of the pxDelayedLearningFlow data flow provides mapping between the properties in the strategy result class and the Event Store properties. When the MakeDecision strategy is configured in such a way, the adaptive model's learning process can begin. When you decide to use adaptive models to select offers based on the adaptive model output in subsequent outbound campaigns, you need to use a data flow. 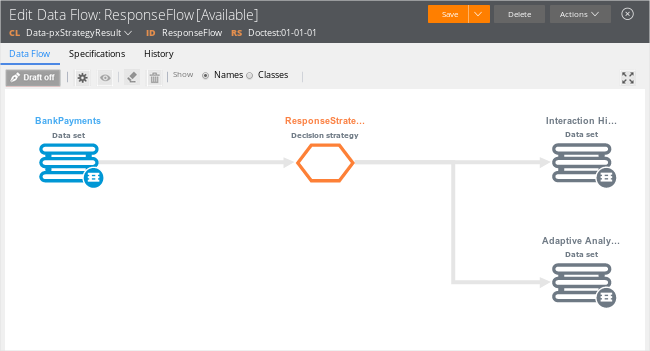 In this example, the ResponseFlow data flow that references Response strategy. The Response strategy must operate in the Capture response for previous decision mode. 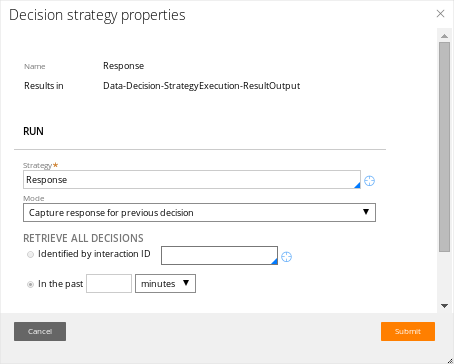 Identified by interaction ID - When you select this option and provide an Interaction ID, the Subject ID and Interaction ID fields that are mapped in the strategy inputs, are used to uniquely identify particular records in the pxDecisionResults data set. Data from the pxDecisionResults data set is embedded in the strategy results and sent to the Adaptive Analytics data set to update ADM models. Then, the Event ID from the snapshot and the Subject ID of the customer are used to uniquely identify particular records in the pxDecisionResults data set. Data from the pxDecisionResults data set is embedded in the strategy results and sent to the Adaptive Analytics data set to update ADM models.